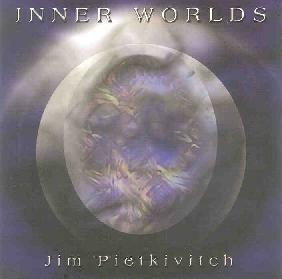 Jim Pietkivitch - "Inner Worlds"
I’ve always been fascinated by musicians who could creatively sneak classical music inspired riffs into their songs. It’s what made me give up Top 40 for Progressive Rock when I was just a kid. Over the years I’ve sampled a variety of bands that successfully mated classical and rock. To be honest, I’m pretty particular about my music, and while I liked all of them, I drifted away from most of them over the years. I did manage to find a few gems and three symphonics that still find their way into my regular rotation are Enid - In the Region of the Summer Stars, Anthony Phillips - Slow Dance, and Michael Oldfield - Islands. Of course, over the years my musical tastes changed. I no longer seek out progressive rock with the fierce determination I once did and symphonic even less. So, like I’ve said here before, lots of music goes right by me and I never even know it. That brings me to Jim and Inner Worlds. Jim plays keys, percussion and oboe. He’s joined on 2 tracks by Melanie Lunsford who plays flute and sings. I should tell you that I really like this recording. It is without a doubt one of the most beautiful symphonic works I have heard in a very long time. Even though it’s electronic keyboards, it’s mostly natural sounding instruments and organic patches. There is a very light sprinkling of percussion to add a bit of snap when it’s needed. The songs themselves are, well, beautiful. Lilting melodies balanced out with gentle accompaniment. Miles away from ambient, but soothing and introspective just the same. Even though it’s an all instrumental album, it’s never boring or repetitive, and I never found myself tuning it out (even briefly). This one will join my regular rotation, stuffed in between Jeff Greinke, Robert Rich, and the Ozrics. For more information you can visit the Electrofine Music web site at: http://www.electrofine.com.